18K GOLD GIA CERTIFIED 6.45 CT. UNHEATED VIVID ROYAL BLUE CEYLON SAPPHIRE AND VS DIAMOND COUTURE "SNOWFLAKE" RING! 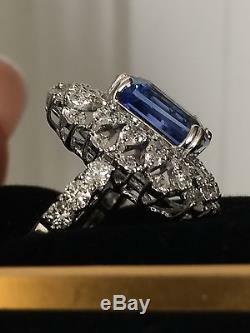 THIS IS A TOP GEM, ONE-OF-A-KIND, 6.45 CARAT TOTAL GEM WEIGHT RING, FEATURING AN INCREDIBLY RARE, NATURAL EARTH-MINED FROM CEYLON (SRI LANKA) GIA CERTIFIED, NO HEAT ROYAL BLUE SAPPHIRE, SET INTO SOLID 18K WHITE GOLD, AND SURROUNDED BY GENUINE SPARKING ROUND BRILLIANT CUT DIAMONDS, IN A STUNNING COUTURE DESIGN. THIS GORGEOUS COUTURE RING IS ABSOLUTELY STUNNING AND MAKES A BEAUTIFUL STATEMENT PIECE!!!! 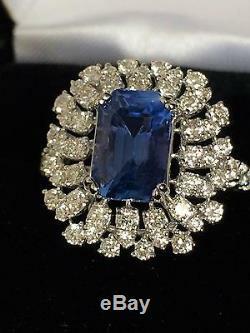 THIS GEMSTONE IS NOT A MURKY, CLOUDY, DE-SATURATED SAPPHIRE (AS MOST ARE). 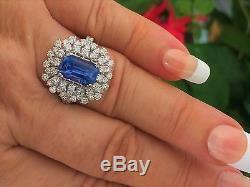 THIS GEMSTONE IS TRULY A MUSEUM QUALITY, CRYSTAL CLEAR, TRULY VIVID BLUE CEYLON SAPPHIRE. YOU MUST SEE IT TO BELIEVE IT. PLEASE NOTE THAT THESE PHOTOGRAPHS WERE TAKEN WITH MY IPHONE CAMERA, AND MOST OF THEM IN DIRECT SUNLIGHT OUTDOORS...... THIS RING IS ABSOLUTELY BEAUTIFUL IN PERSON!! THIS SPLENDID UNHEATED CEYLON SAPHIRE IS A FINE, FULLY SATURATED PERFECT BLUE COLOR. THIS EXTRAORDINARY SAPPHIRE IS SUPER-CLEAN, AND DISPLAYS NO ZONING NOR DARK SPOTS. 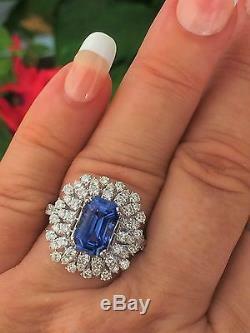 THIS BEAUTIFUL SAPPHIRE IS A MODIFIED BRILLIANT CUSHION CUT & WEIGHS AN IMPRESSIVE 4.15 CARATS. THERE ARE ALSO NATURAL, EARTH-MINED, ROUND BRILLIANT CUT DIAMONDS, WEIGHING APPROXIMATELY 2.30 CARATS, AND ARE COLORLESS TO NEAR COLORLESS F-G COLOR. THESE STUNNING, EYE-CLEAN DIAMONDS ARE GRADED AT VS TO SI CLARITY, SO YOU CAN BE ASSURED OF THE OUTSTANDING QUALITY, EXCELLENT BRILLIANCE, FLASH, SPARKLE AND FIRE. THIS BEAUTIFUL RING IS TRULY A FINE COLLECTOR'S PIECE, AND IS A ONE-OF-A-KIND DESIGN. THIS IS TRULY A STATEMENT PIECE! CARAT TOTAL WEIGHT: 6.45 CARATS SAPPHIRE WEIGHT: 4.15 CARATS COLOR: PURE BLUE (PER GIA) CLARITY: TRANSPARENT EYE CLEAN - HIGH BRILLIANCE SHAPE: MODIFED BRILLIANT OCTAGON CUT (BEAUTIFUL CUTTING) ORIGIN: SRI LANKA (CEYLON) TREATMENT: NO HEAT - NO TREATMENT SATURATION: MEDIUM TO VIVID (NO ZONING) TONE: MEDIUM TOTAL DIAMOND WEIGHT: 2.30 CARATS DIAMOND COLOR: COLORLESS TO NEAR COLORLESS (F-G) DIAMOND CLARITY: VS TO SI RING METAL TYPE: SOLID 18K WHITE GOLD RING SIZE: 7.00 (SIZEABLE) COLORED STONE INFORMATION: ONE PRONG-SET, MODIFIED BRILLIANT OCTAGON CUT, NATURAL EARTH-MINED ROYAL BLUE SAPPHIRE. THIS GEMSTONE DISPLAYS A BEAUTIFUL INTENSE ROYAL BLUE COLOR, WITH EXCELLENT SATURATION AND BALANCE. YOU'RE GONNA LOVE IT!! THIS GEMSTONE DISPLAYS NO GRAY NOR GREEN TONES. IT HAS A BEAUTIFUL CRYSTALLINE APPEARANCE AND DISPLAYS NO ZONING. THIS GEMSTONE IS NOT OVERLY DARK, LIKE MANY SAPPHIRES CAN BE. 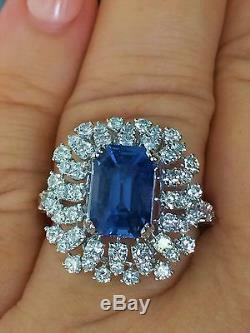 THIS GIA CERTIFIED SAPPHIRE HAS SUPER HIGH BRILLIANCE AND SHINE, AND WOULD BE CLASSIFIED AS FINE. SIDE STONE INFORMATION: THIS PIECE IS SET WITH NATURAL EARTH-MINED, ROUND BRILLIANT CUT DIAMONDS THAT ARE COLORLESS TO NEAR COLORLESS, WITH VS TO SI CLARITY, AND WEIGHS A RESPECTABLE 2.30 CARATS. THE COLOR AND CLARITY ARE AVERAGE FOR THE GROUP, AND THE DIAMONDS ARE GRADED IN THE MOUNTING. THIS IS TRULY A LARGE SPARKLY STATEMENT PIECE!! THE INVESTMENT POTENTIAL AND THE MESMERIZING BEAUTY OF THIS FINE RING IS OBVIOUS, AND YOU WILL NOT WANT TO TAKE IT OFF YOUR FINGER. THE EXQUISITE RING IS DESTINED TO BECOME A CHERISHED FAMILY HIERLOOM, AND IS AN ABSOLUTE STEAL AT THE PRICE. 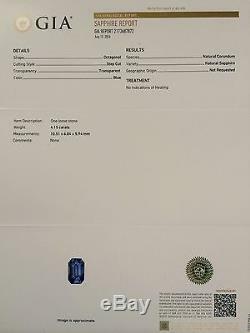 PLEASE DON'T BE MISLED BY OTHER DEALERS THAT TRY TO SELL YOU "CEYLON SAPPHIRE" THAT IS NOT LABORATORY CERTIFIED! THIS PIECE COMES WITH A GIA CERTIFICATION AND BEAUTIFUL PRESENTATION BOX. 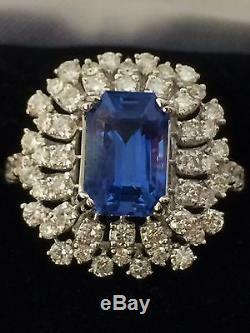 The item "18K GOLD 6.45 CT GIA CERTIFIED NO HEAT UNHEATED ROYAL BLUE SAPPHIRE DIAMOND RING" is in sale since Sunday, July 2, 2017. This item is in the category "Jewelry & Watches\Fine Jewelry\Fine Rings\Gemstone". The seller is "finejewelry77" and is located in Laguna Beach, California. This item can be shipped to United States, Canada, United Kingdom, Germany, France, Australia.